Townshend Terrace is a home that is surrounded by the natural elements of a Conservation Area and is considered to be of Townscape Merit. Our team provided unarguable supporting information for the Planning Application and sailed to the Approval of our proposed design. The Clients at Townshend Terrace had moved to Richmond to embrace the spirit and atmosphere that would enhance their active lifestyle. They would be nearer to their grandchildren and in close proximity to the cultural activities and facilities. They bought their home with the intention of extending and refurbishing the whole house such that it serves their needs. 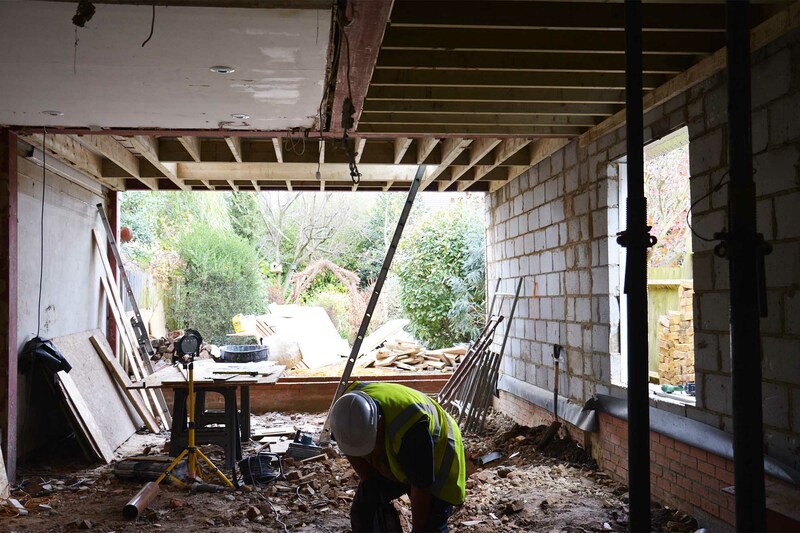 While being very involved in the development of their home, they also completely trusted us to fully understand their brief and execute, and to take the lead in doing so. The house may seem to follow the typical London typology where we opened up the ground floor plan to modern design and incorporated fantastic wall-to-wall floor-to-ceiling sliding glass doors that connect the internal space to the beautiful garden, while bringing lots of light in, but there are quite a few design elements that make the house bespoke and tailored just for the specific Clients. For example, we proposed a large window with a window seat facing a green wall along the side of the house, therefore bringing their love of the garden deeper into the plan and creating a side view aspect quite unusual in such an urban layout. This window was initially meant to be fixed glazing, but in collaboration the Client expressed how fun it would be if the kids could climb in and out of this. So, the specification of this window changed to openable. What a charming idea with a story behind it! A green roof extends the garden view for the rooms upstairs and is just one of the features that form part of the house’s sustainable design. Townshend Terrace is in a Conservation Area. Moreover the house is considered to be of Townscape Merit. Along with the usual and expected dose of unhelpful neighbours, the Planning process became a battle. But the Clients had a very enlightened approach and dealt patiently with the peculiarities of the system. We provided unarguable supporting information, diagrams and discussions, and with the client negotiated each point with the planning officer to get approval on what we had designed. We followed our usual Process and produced a highly detailed package for this project with extensive research done to reduce risks at all stages from Planning to Building Control, Tender and Construction. The house is now transformed into a light and spacious home that the Clients are thrilled with, and with contemporary elements that reflect the Client’s lifestyle and aesthetic preferences.